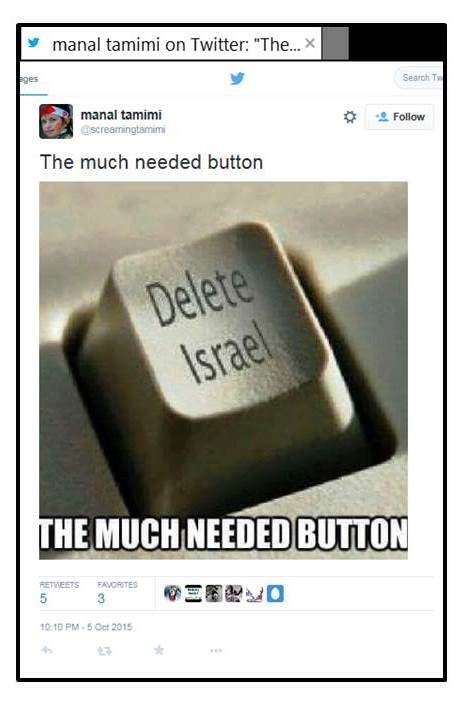 The same could be said about Ehrenreich’s new book; yet, reviewers for highbrow outlets like the NYT and The Economist were hardly able to contain their heartfelt sympathy for Ehrenreich’s terror-loving Jew-hating protagonists – which presumably means that none of them noticed or was bothered by the fact that Ehrenreich does acknowledge in his book that the Tamimi family includes several much-loved terrorist murderers. 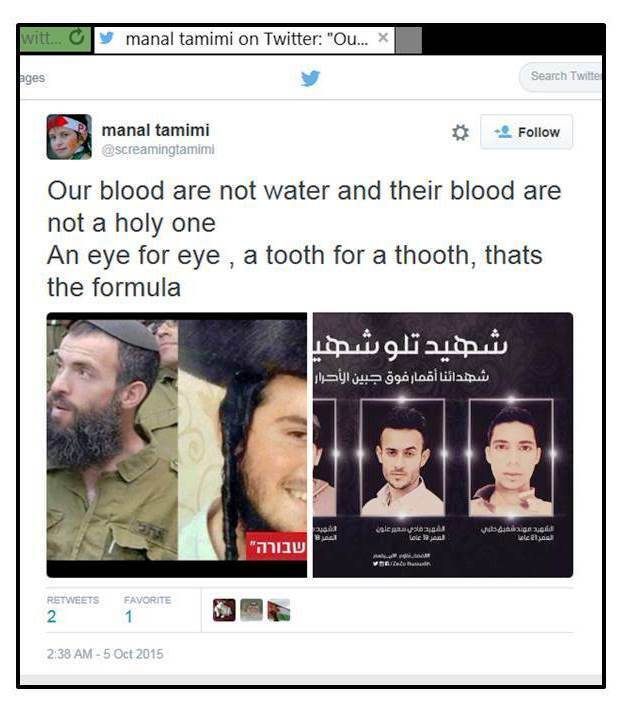 I began to document the Tamimis’ ardent support for terror and their equally ardent Jew-hatred a year ago and wrote several posts; a more systematic and thorough documentation was published in the November issue of The Tower Magazine (How a Family Became a Propaganda Machine), where I argued that it was completely unethical for Amnesty International to promote the Tamimis as supposedly non-violent defenders of human rights. 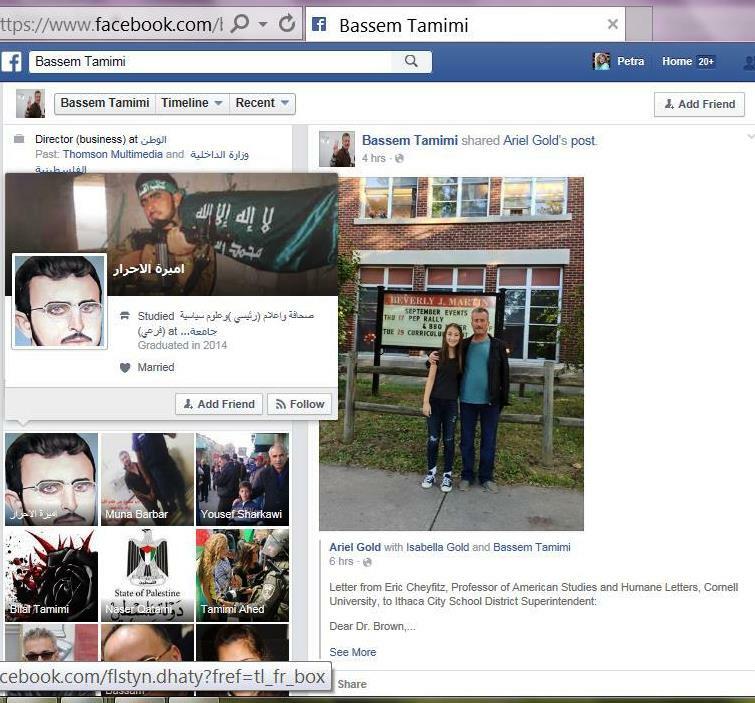 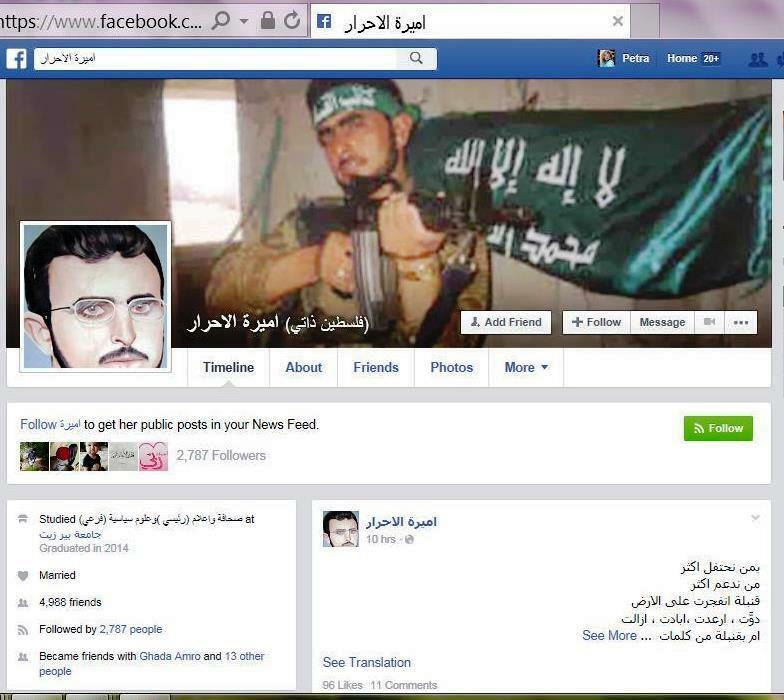 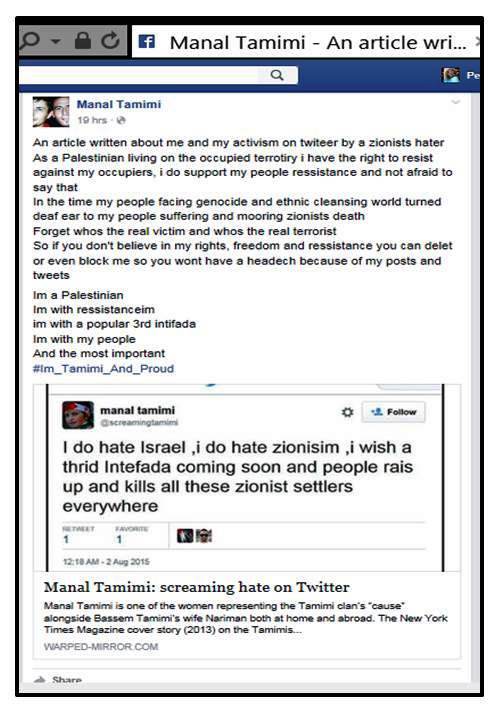 After the publication of Ehrenreich’s book in June, I updated my research on the Tamimis and documented their ongoing support for terrorism and their seething Jew-hatred in several additional posts (see e.g. 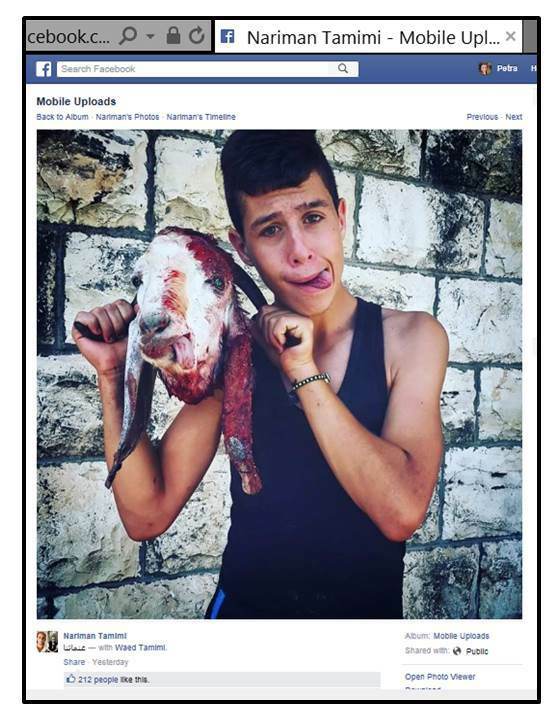 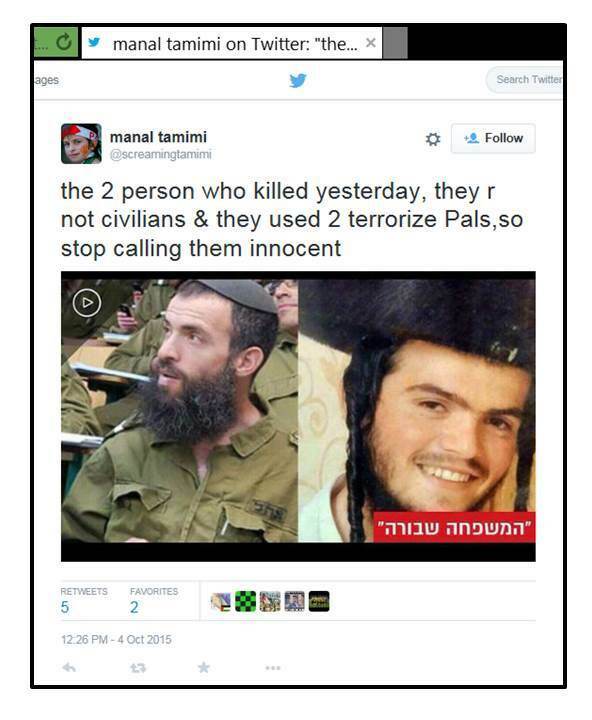 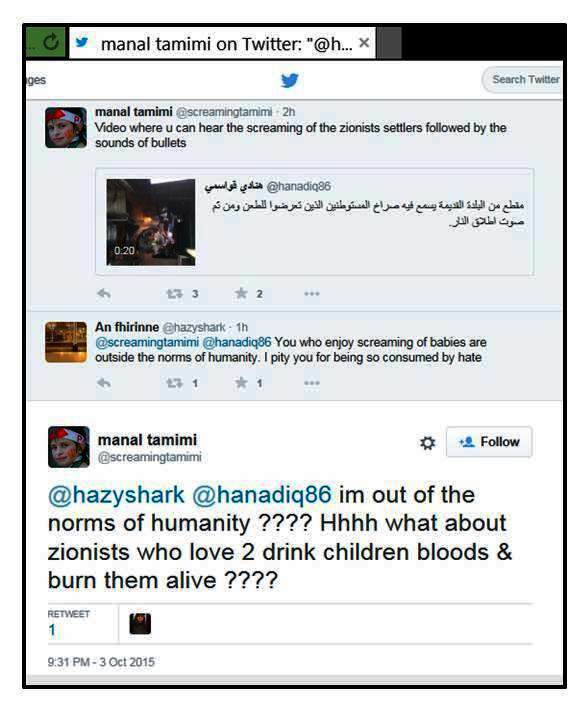 Ben Ehrenreich’s obscene empathy with the terror-supporting Tamimis). 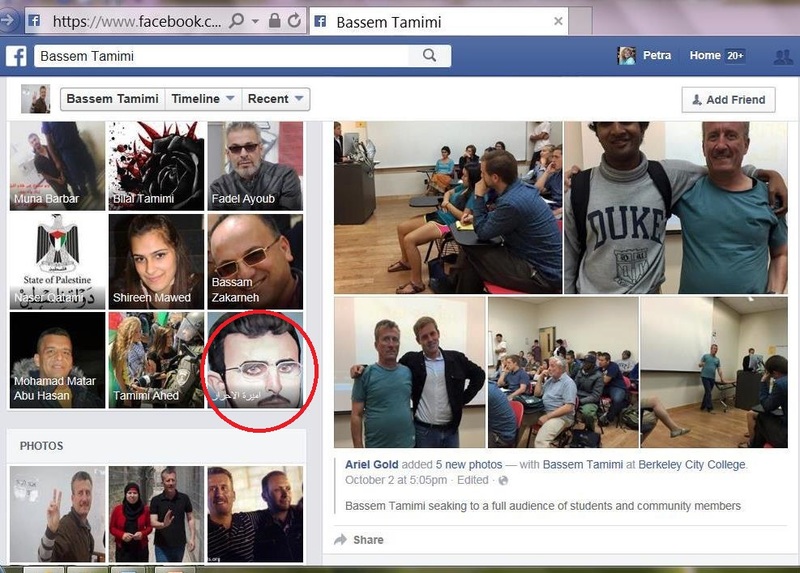 Given that Ehrenreich’s book – and the glowing reviews for it – were published just a few weeks before the 15th anniversary of the Sbarro massacre, which was planned and facilitated by Ahlam Tamimi, I very much appreciated that Tablet published a related post of mine (though I didn’t get to choose the title): Was Ben Ehrenreich Bamboozled By a Palestinian Terror Clan? 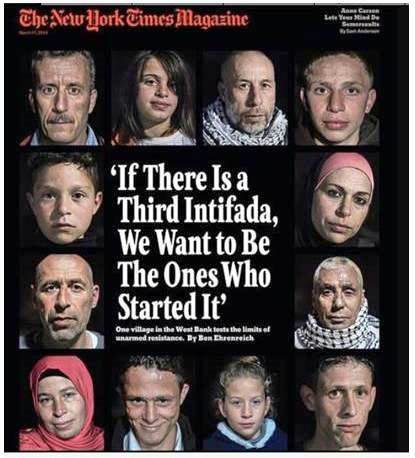 Another related piece was first published at Harry’s Place and is cross-posted below; it includes a YouTube video I put together in collaboration with Elder of Ziyon; the clip offers a short introduction to the four Tamimi family members listed first in the Acknowledgements to Ehrenreich’s book. 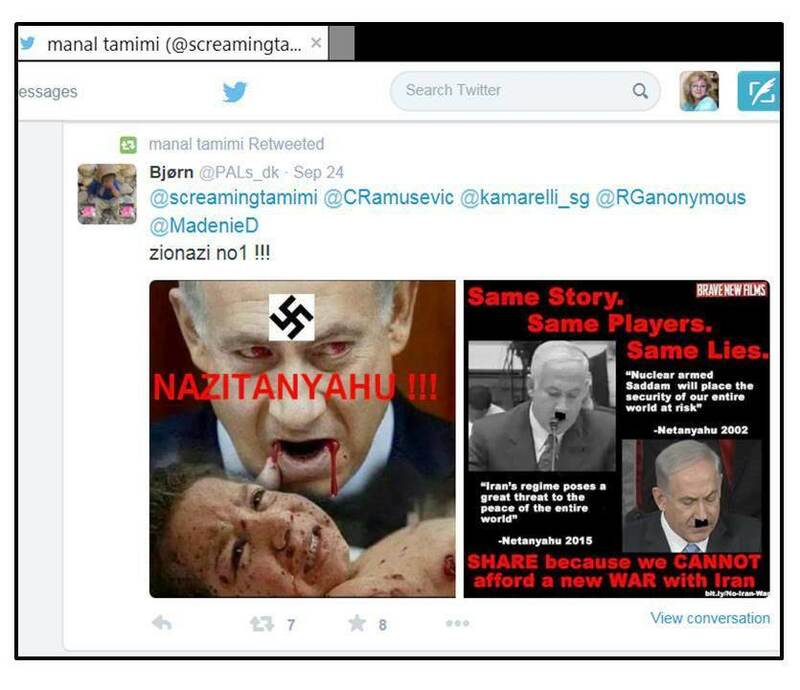 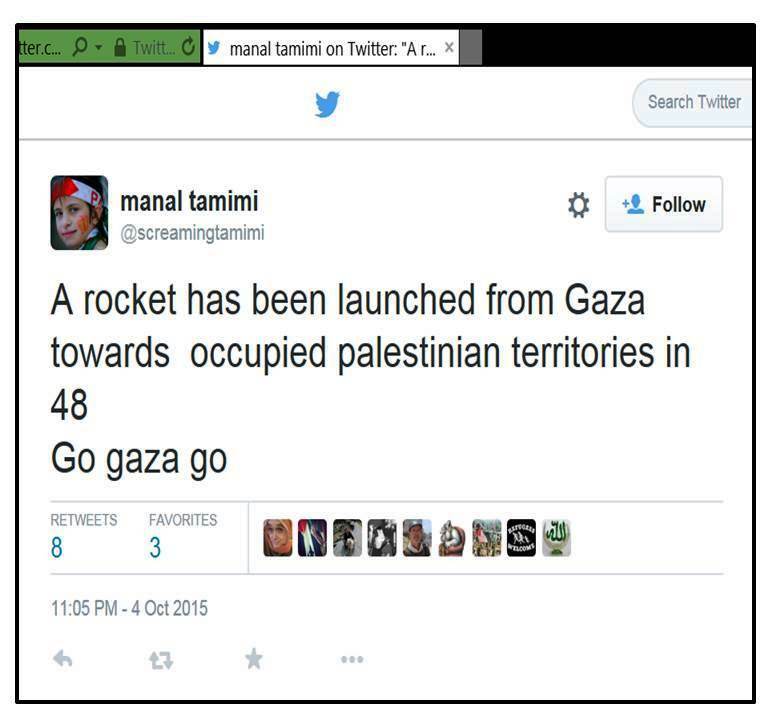 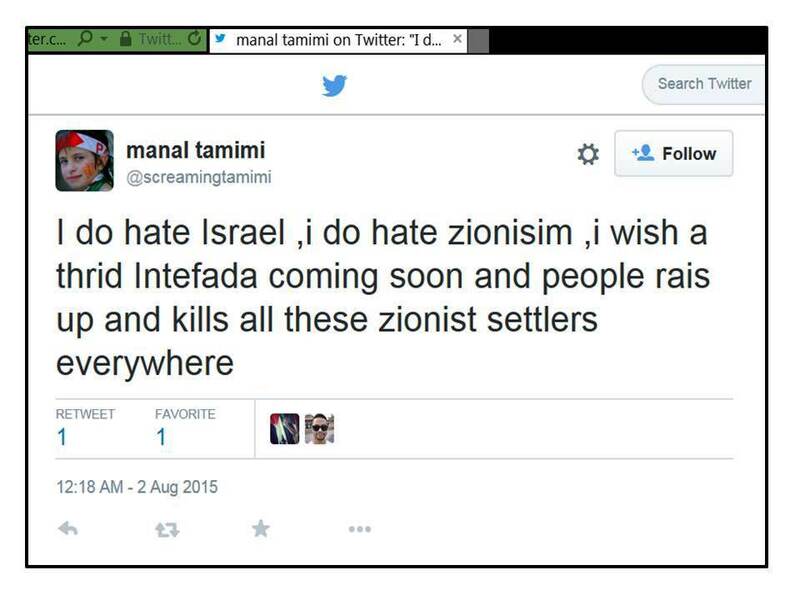 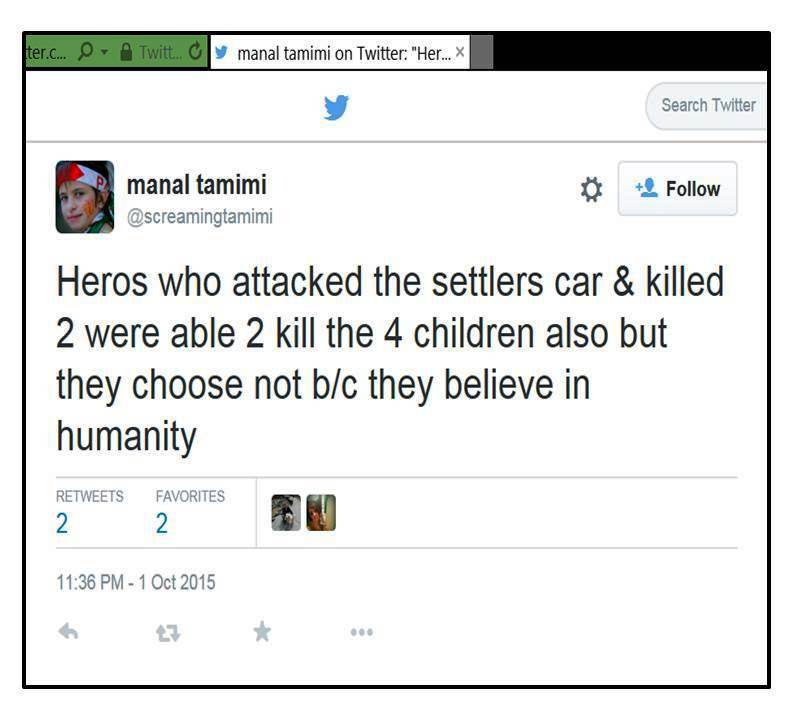 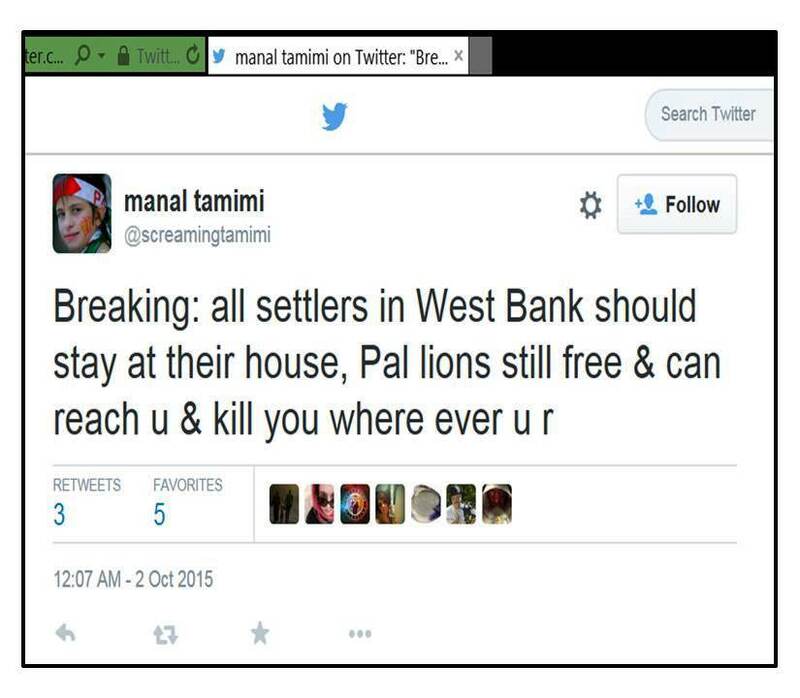 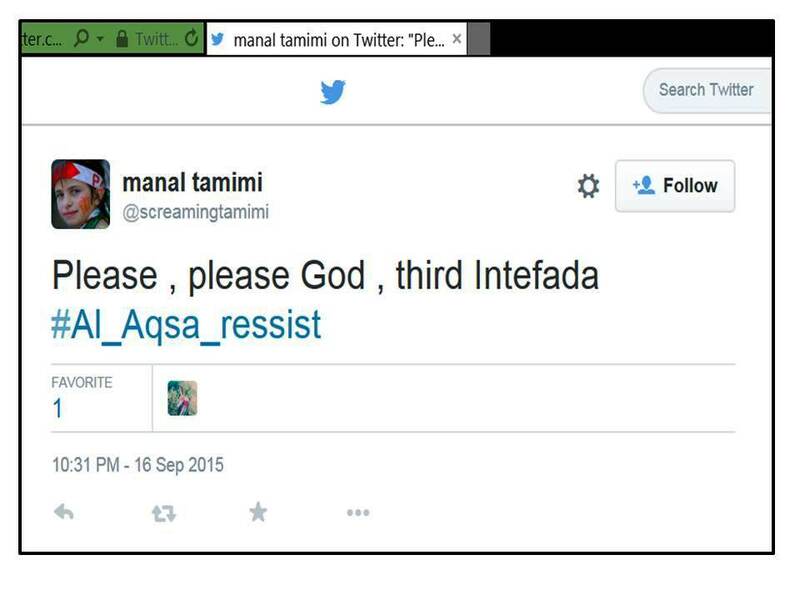 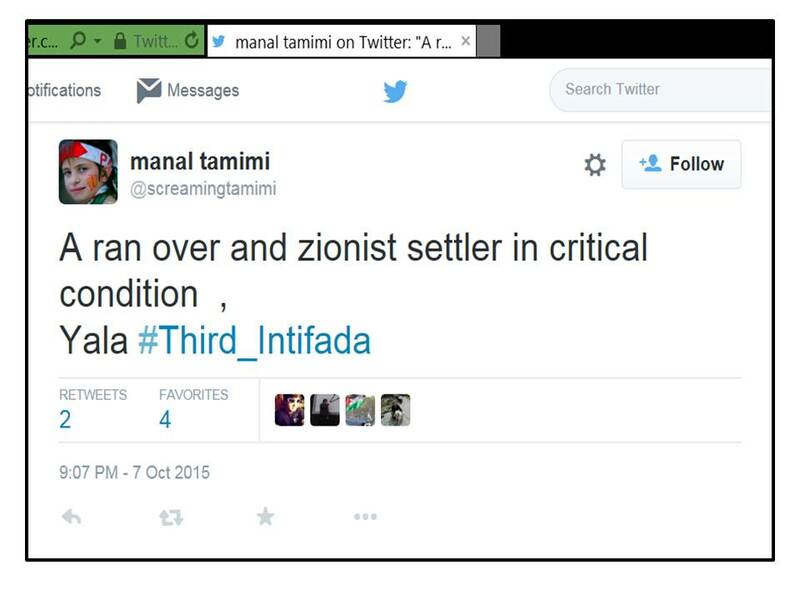 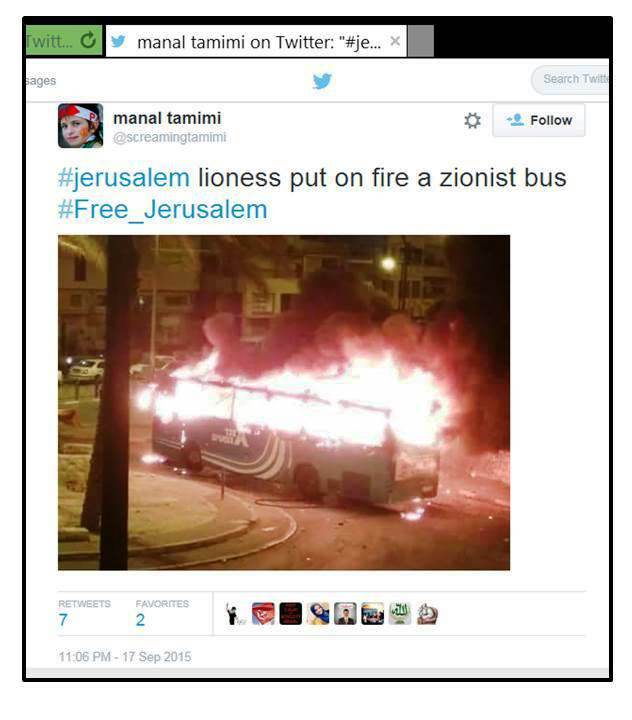 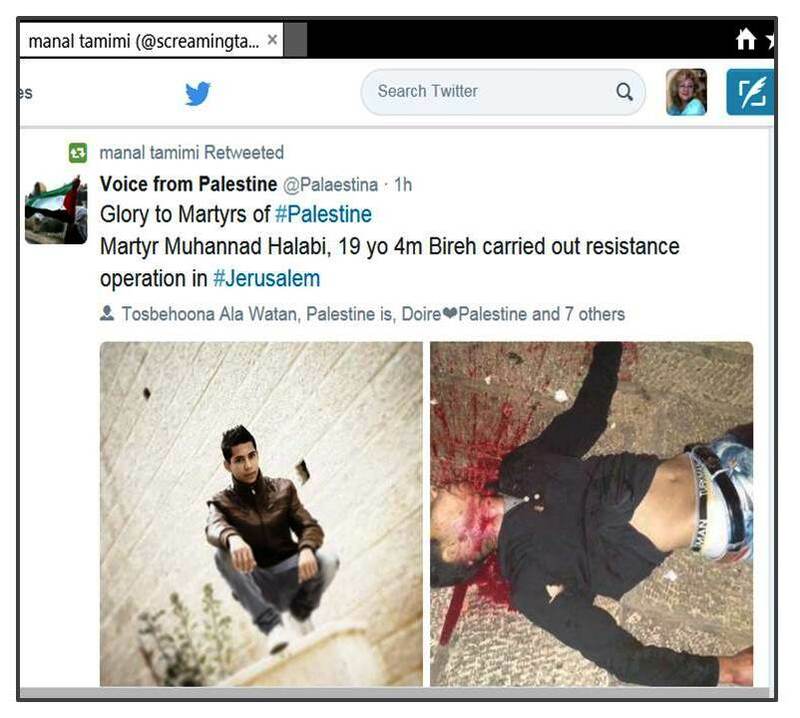 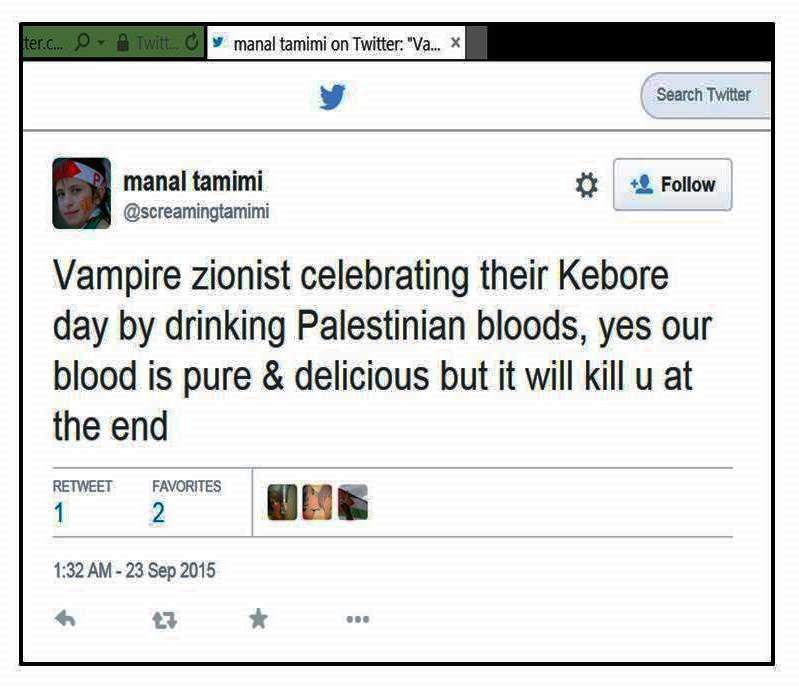 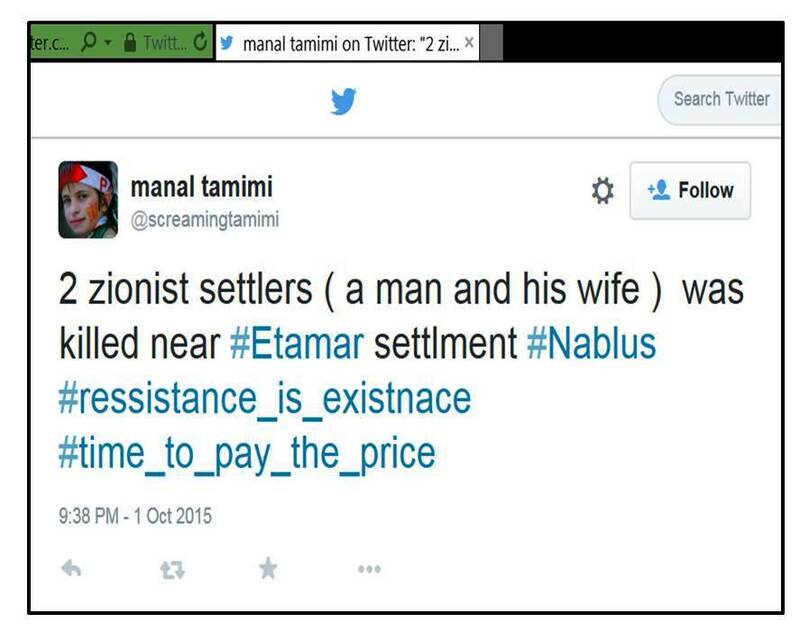 I later also created a slide show featuring about 40 tweets by Manal Tamimi, which provide a glimpse of the intense hatred that drives the Tamimis. So I should really say: dear Manal, you are very welcome. 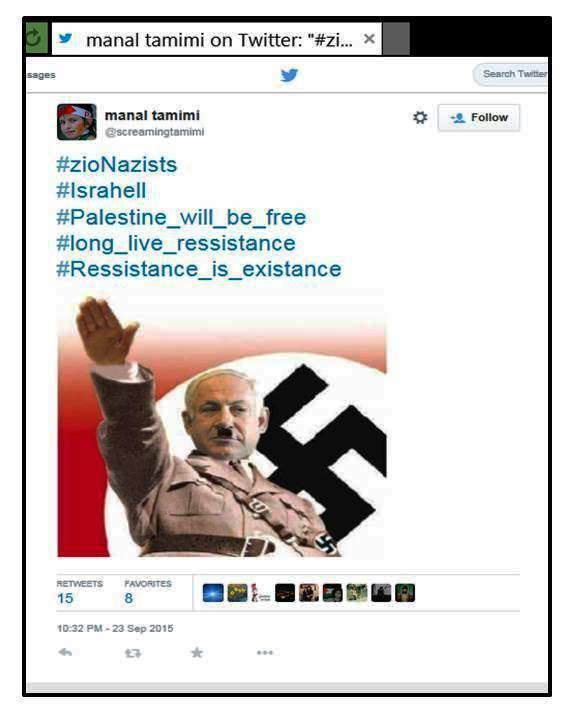 In fact, it is me who should thank you for taking all this time to provide us with such a revealing glimpse of your ardent support for terror and your equally ardent Jew-hatred. 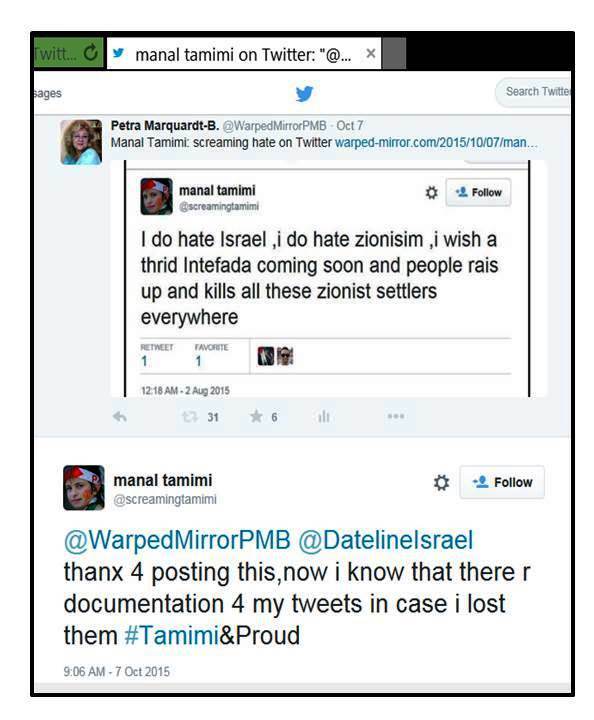 But courtesies aside, I’ll admit that I was not just being polite when I followed Manal Tamimi’s encouragement and put together a slide show featuring about 40 of her tweets (see the YouTube clip at the end of this post). 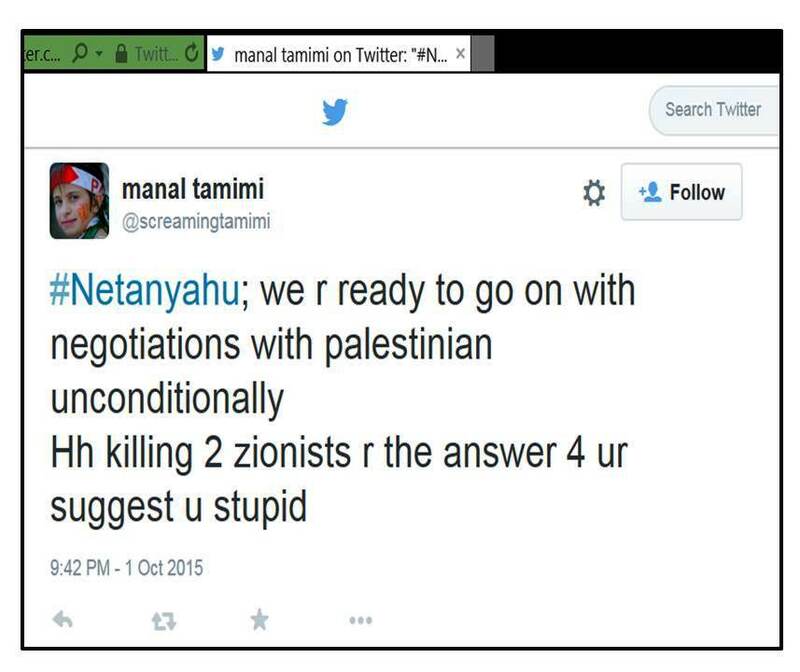 There are several reasons why her tweets are important. 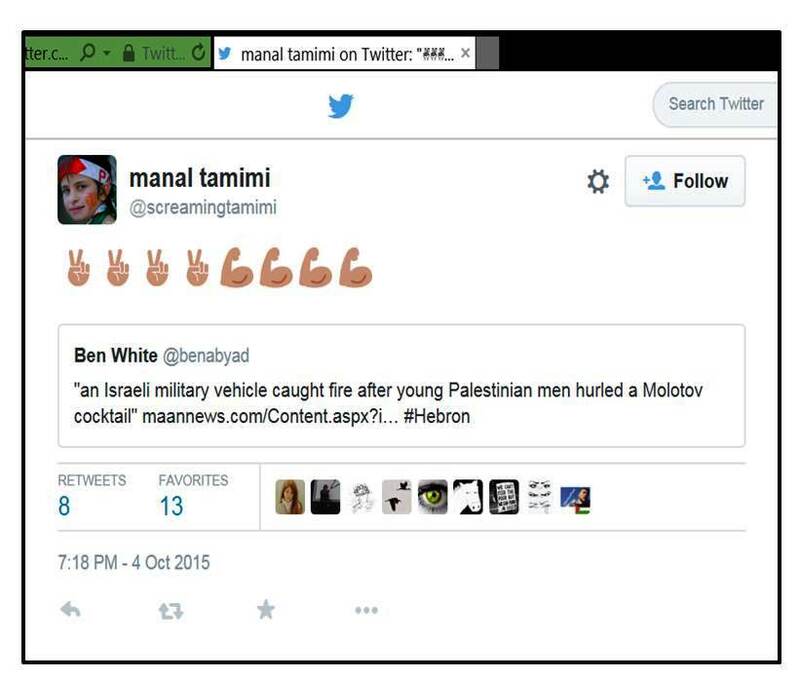 First, it should be recalled that Ben Ehrenreich’s tribute to the Tamimis, which was featured as a New York Times Magazine cover story three years ago, presented her as a member of the “homegrown media team” that runs the PR efforts of Tamimi Press, noting that Manal Tamimi had taken it upon herself to supplement these efforts “with a steady outpouring of tweets (@screamingtamimi).” So it seems fair to conclude that the views she expresses are not just her own, but reflect the outlook of her fellow “activists” in Nabi Saleh. 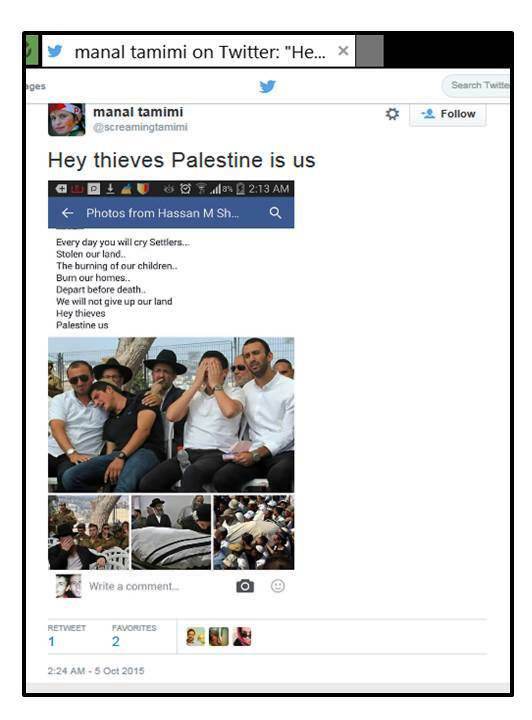 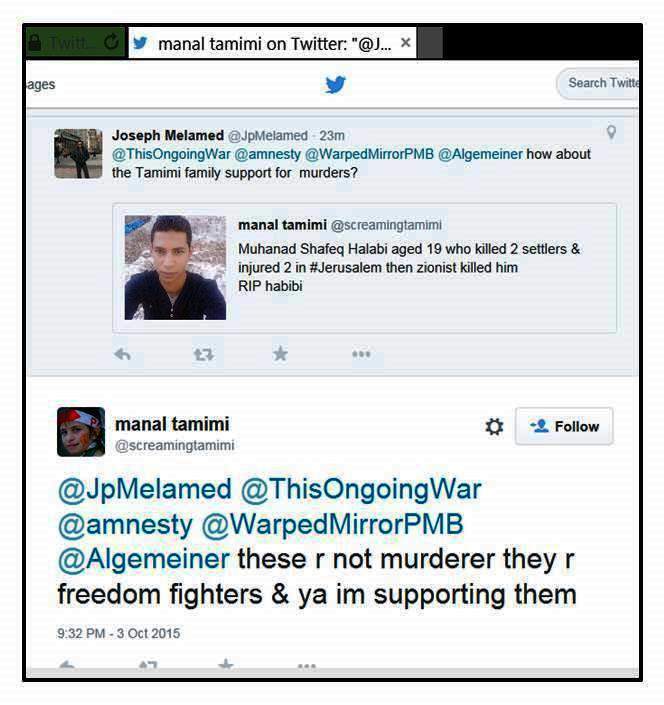 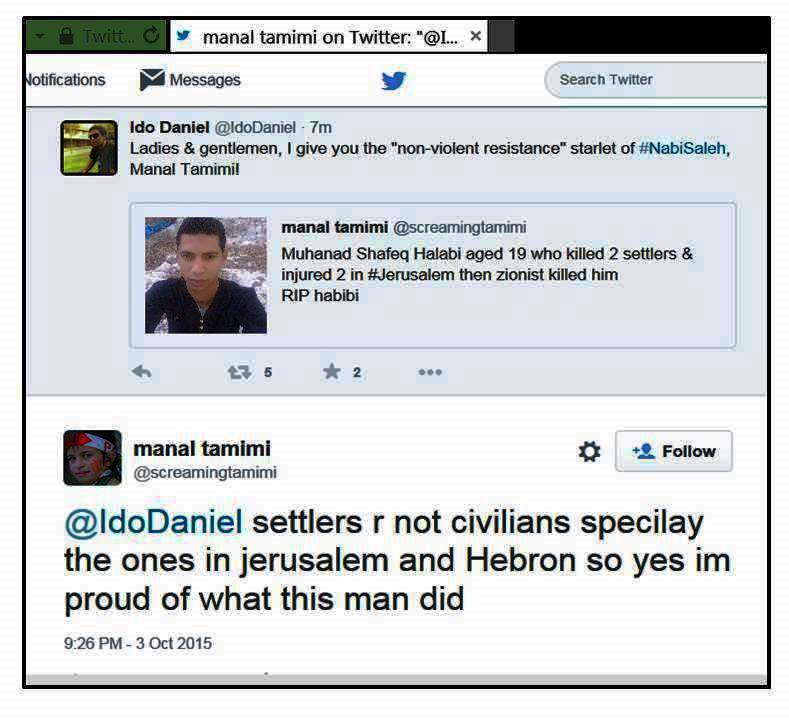 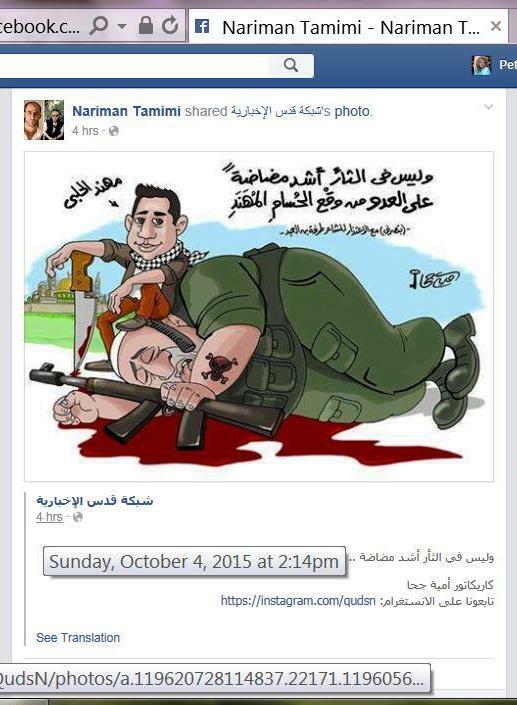 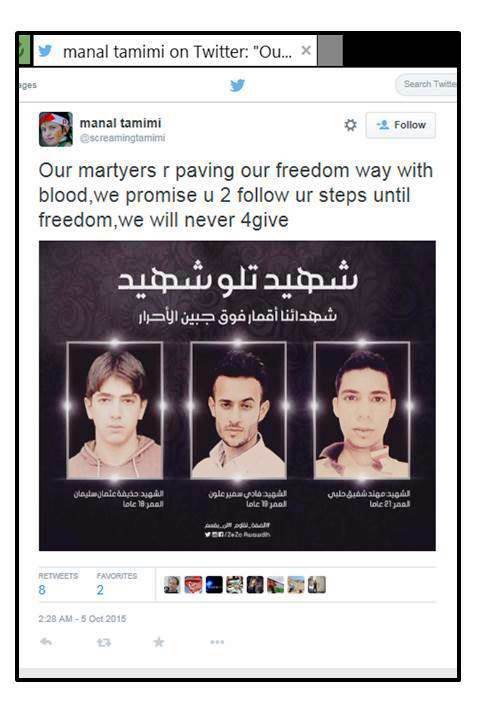 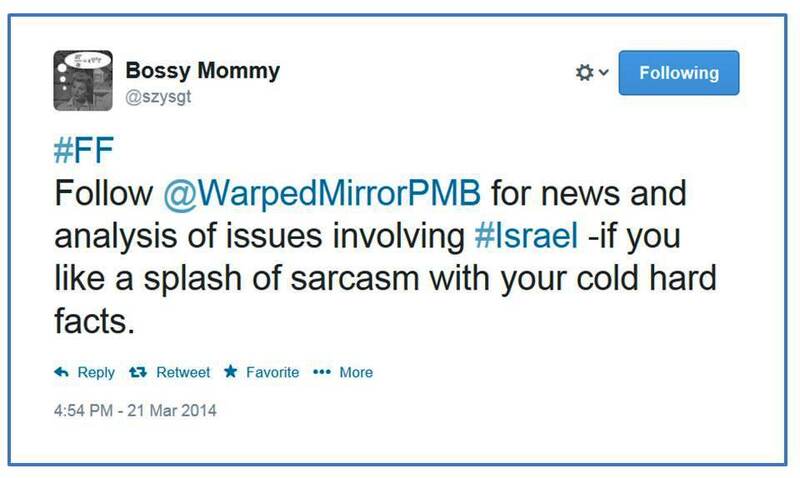 Indeed, if one considers the publicly available social media posts of other prominent Tamimi clan members (also documented in this EoZ video), it is clear that Manal Tamimi’s output on Twitter is quite representative of the hatred and extremism they all regularly exhibit – so far apparently without jeopardizing the support they’ve enjoyed for years from Amnesty International. 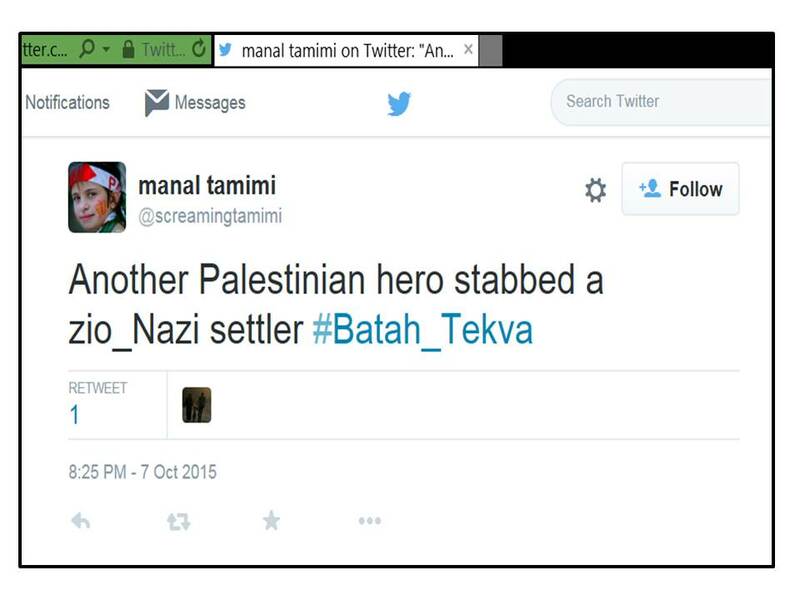 Perhaps she just meant to say something like “Sieg Heil”? 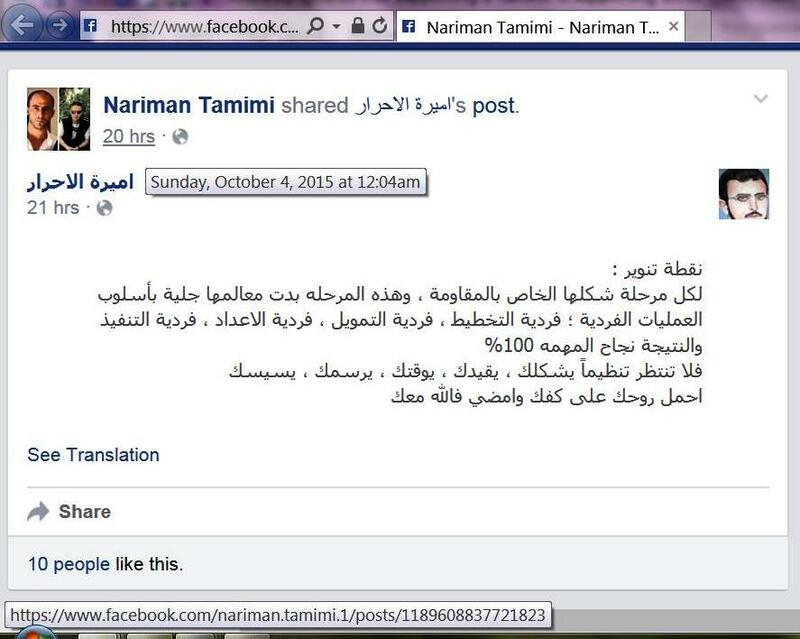 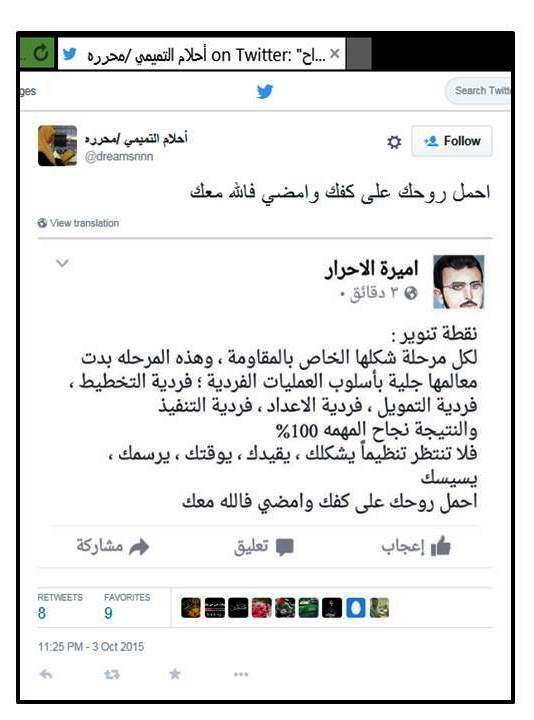 *Translations from Arabic courtesy of Ibn Boutros; since the Tamimis sometimes delete posts that attract widespread public criticism, the post is archived here. 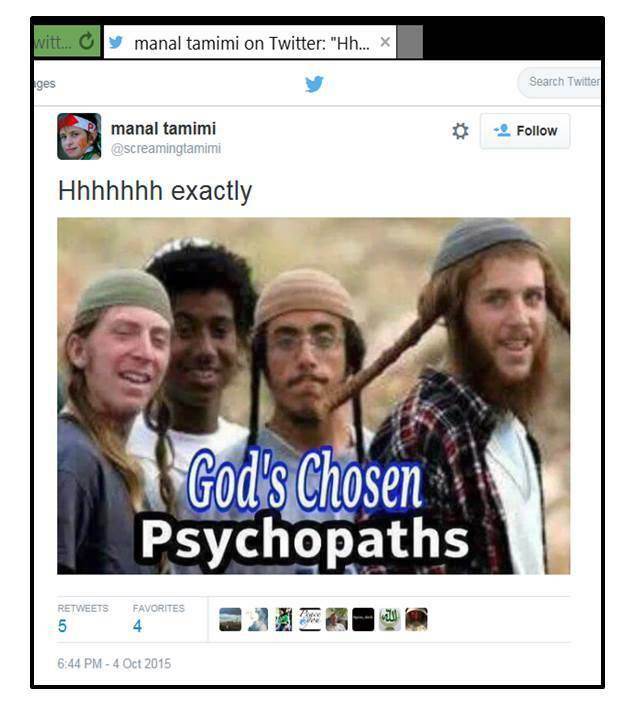 First published at Elder of Ziyon.